I suppose after knowing I just spent two weeks abroad, you're probably looking for some sort of travel updates? Well, I suppose it's about time to give you some! The plan is to post one entry per day in each major city, so 8 in total, and I'll include a few random photos to help make the story easier to enjoy. We'll start where we started... Copenhagen, Denmark. My favorite part of the flight over was that I was wearing a Styx t-shirt. Puff kept making fun of me and I kept insisting that people in Denmark like Styx. He wasn't so sure. After hours of him picking on me, it finally settled down as we made our final approach to land. We had all but forgotten about it. Until I walked off the plane. There was a Danish guy, working for the airport, on the gangway. "Styx!!!" I heard someone yell from behind me. I turned around to see him. He flashed a major smile and gave me a thumbs up. "They're a really good band!" See, Puff. I told you they like Styx in Denmark. Boo yah. I'm pretty sure pastries are the reason people go to Denmark. If it's not, it totally should be. 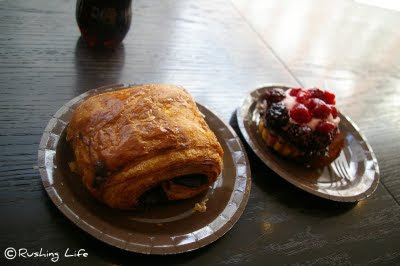 We stumbled across a bakery whose window was so full of goodies, I thought my head might explode. Don't worry... we managed to squeeze in another stop there before we left town. 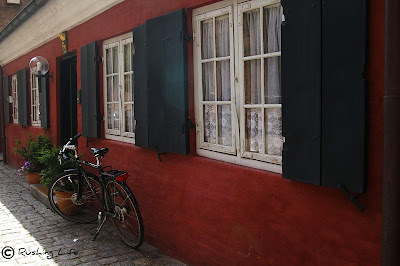 In our sleep-deprived wanderings, we stumbled through a back courtyard between the library and a castle and found this adorable little red house. This is why veering off the well-traveled tourist path is always a good idea. 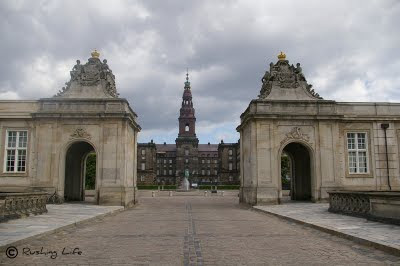 Old cities with old castles and palaces are always fun. While we couldn't go inside, or didn't even try, Christianborg Slot was a beauty. With the skies threatening rain, we didn't hang around long, but snuggled up against each other under some trees for a second before snapping some photos and moving right along. 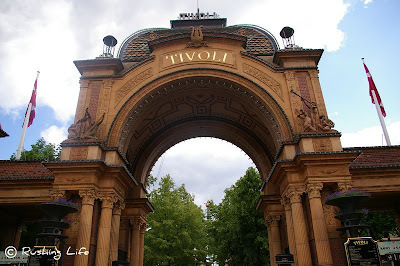 Nothing screams Copenhagen to me more than Tivoli Gardens. It's one of the oldest amusement parks in the world and was full of fun things like pantomime theaters and Indian-inspired buildings. Puff and I watched children ride hot air balloon inspired ferris wheels and relaxed in lounge chairs on a green field in front of an amphitheater. The calm of such a fun, nostalgic, place was extraordinary. We topped the day off with a pizza in a greenhouse at Tivoli and a 3 hour nap in our hotel room. Dinner was meat-on-a-stick from a street vendor on a bench in the end-of-the-day-bare town hall square. We curled up in bed with Maltesers (my favorite candy when I'm in Europe) and Coke and watched a TV show about head lice. We're nothing if not exciting and enviable.